On May 10, after an almost two-week break, the High Qualification Commission of Judges continued interviewing the candidates for the offices of judges of the new Supreme Court. 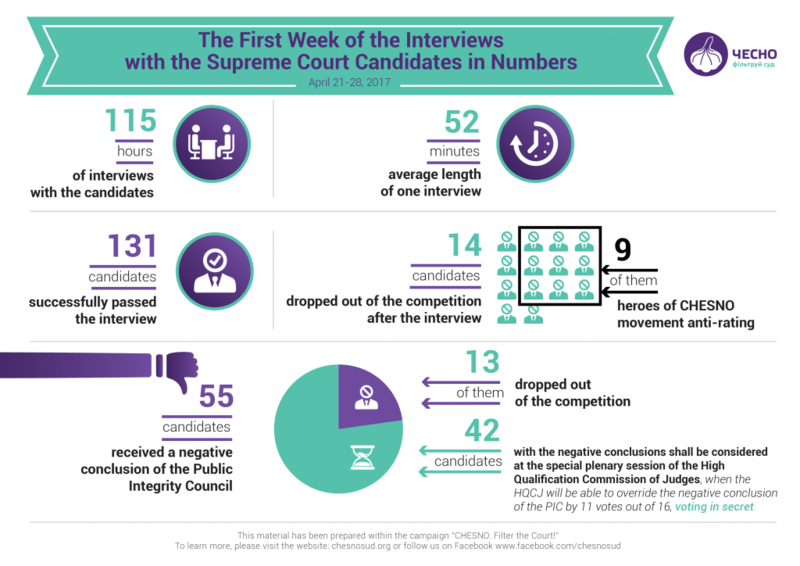 During the first week of April 21-28, the HQCJ conducted interviews with more than one third of all the candidates – as a result, 10% of them have dropped out. Thus, 14 participants out of 131 will no longer participate in the competition. Among them – nine heroes of the anti-rating of CHESNO movement presented within the campaign “CHESNO. Filter the Judiciary!” during the first days of the interviews. Among the heroes of the CHESNO movement anti-rating who dropped out of the competition is Alla Demydova, candidate to the Economic Court of Cassation within the Supreme Court, who was ranked among the richest judges of the ECC. Judge Demydova has dropped out because she had provided false information in her declaration and passed court rulings notwithstanding the conflict of interest. Olena Hanechko, candidate for the position of judge of the Administrative Court of Cassation – who tried to explain during the interview why she had released from arrest the stepson of Dmytro Firtash, suspected of causing a car accident in which several people were killed – has also dropped out of the competition. Petro Burda, candidate to the Criminal Court of Cassation – who was dismissed from the position of the judge in 2007 for the violation of the oath and has demonstrated during the interview that he does not meet the requirements for a Supreme Court judge – will no longer take part in the competition either. At the same time, several notorious candidates continue running for offices despite the fact that they are heroes of the CHESNO movement anti-rating and had received negative conclusions from the Public Integrity Council. Thus, Pavlo Vovk, head of the District Administrative Court of Kyiv – the hero of numerous media investigations concerning his political ties with MP Oleksandr Hranovskyi from the Petro Poroshenko Bloc, the so-called “curator” at the prosecutor’s office and courts – remains an active participant of the competition. Hryhoriy Alieinikov, judge of the Central District Court of Mykolaiv, has not dropped out in spite of his unethical behavior during the trial and the violation of human rights. Judge Alieinikov has gained notoriety when he forbade the journalists to record an open trial. During the interview, he has also demonstrated that he cannot speak Ukrainian fluently. The first week of the interviews has showed that the negative conclusions of the Public Integrity Council concerning the Supreme Court candidates do not ensure the expected “veto” on the further participation of the applicants considered by the public as dishonest. The High Qualification Commission agreed only with 13 conclusions out of 55 prepared by the PIC about the candidates who had the interviews during the first week. Therefore, during its special plenary meeting, the HQCJ will be able to override two thirds of the negative conclusions of the Public Integrity Council (which have not been taken into account by the HQCJ during the first week of the interviews) by anonymous voting, requiring 11 votes out of 16.
Who Should Not Enter the New Supreme Court?